Golden, CO -- Third time isn't a charm if you're talking about winning the Super Retriever Series Crown Championship and Lyle Steinman, a competitor from Castile Creek Kennels who won the event for the third time and twice with the same dog. 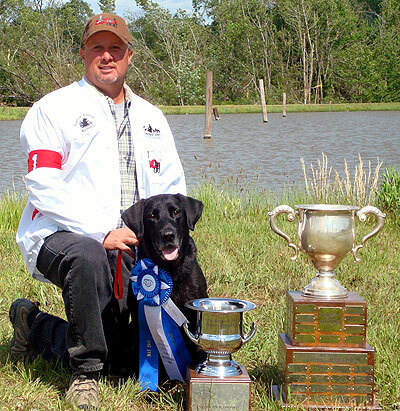 His partner, an eight-year-old black lab named "Jack" (2011 SRSC 2009 SRSC 3 X SRS Fargo's Gulf Coast Jack-Son MNH), which is co-owned by co-owned by John Caire and ZoomDog Supplements, helped Steinman win the championship in both 2011 and 2009, becoming the first dog to ever win the SRS Crown Championship more than once. ZoomDog president Neal Lynch was beaming. "We are so proud of Lyle and Jack for all their hard training that got them to this historic win!" Nice work Lyle and Jack!